On Saturday, April 6, the PIA organized a cleanup event along the banks of the Delaware River to ring in the new season and get residents thinking green. 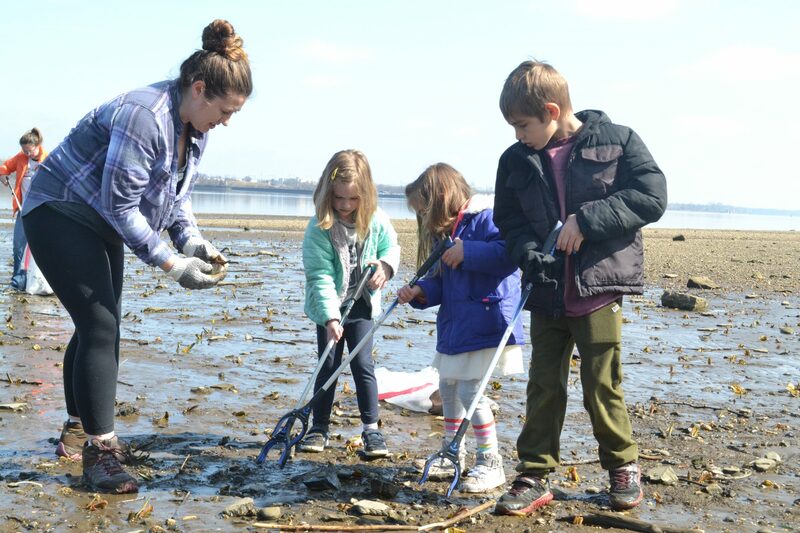 Jessica Porter, along with (from left) Norah Lucas, 5, her niece Aurora Spezzano, 4, and her nephew Giovanni Spezzano, 7, help to pick up trash on the banks of the Delaware River during the Palmyra Improvement Association’s spring river cleanup. When most people think of spring cleaning, they imagine tidying up the house, throwing open a few windows and maybe cleaning out the garage, but when it comes to the Palmyra Improvement Association, spring cleaning is taken to another level. On Saturday, April 6, residents and members of the PIA left their homes behind to tidy up their community. The riverfront portion of Palmyra is a popular walking spot that will be seeing a major rise in foot traffic now that spring has sprung. The group organized the cleanup event to chip away at some of the trash that has washed ashore and piled up along the borough’s stretch of the Delaware River over the winter. According to coordinator Laura Cloud, the new season offers a perfect opportunity for cleanups like this. “Spring is actually a really great time to get out to do a cleanup, in part because all the shrubs and stuff along the edge of the riverbank aren’t overgrown yet, so it’s much easier to see trash and it’s much easier to navigate through the bank. But also because it’s a way for people to get out right at the beginning of the warm season,” said Cloud. Participants in the day’s event enjoyed one of the first temperate weekends of the season, with temperatures reaching into the high 60s. Perfect weather for rolling up your sleeves and getting your hands a little dirty for a good cause. Both the Riverton and Palmyra public works departments pitched in, picking up the trash that was collected during the cleanup. The borough also donated all of the gloves and bags the PIA needed for the event. In addition to her work with the PIA, Cloud is also a member of the borough’s Green Team, made up of members of Palmyra Council and volunteer members of the public. “We are working on initiatives to make Palmyra a greener place,” said Cloud. The Green Team is working toward a Sustainable Jersey certification according to Cloud. The certification is a statewide program for municipalities throughout New Jersey that supports local efforts to cut down on waste and greenhouse gas emissions and improve environmental equity. Actions like the PIA’s river cleanup count toward Palmyra’s bid for certification through Sustainable Jersey. Such a certification not only makes a town look good, but can also lead to grant opportunities it may not otherwise have access to. There are two levels of certification, bronze and silver, that towns can apply for – each with its own requirements. Councilwoman Mindie Weiner, also a member of the Green Team, joined the PIA for the river cleanup. According to Weiner, the Green Team is at work on its second attempt at a bronze level certification for Palmyra. According to Cloud, the PIA is planning two similar cleanup events in town this June and August. For information on these events, check the Palmyra Improvement Association Facebook page.